Joe, I don't know about the crank fired ignition, and I am not familiar with the process, although I know it is sometimes done. I mostly run with VSCCA, not SVRA, and it would be a technical violation, but I don't think they would make too much of a stink. I have a few options as I have a few spare engine blocks. 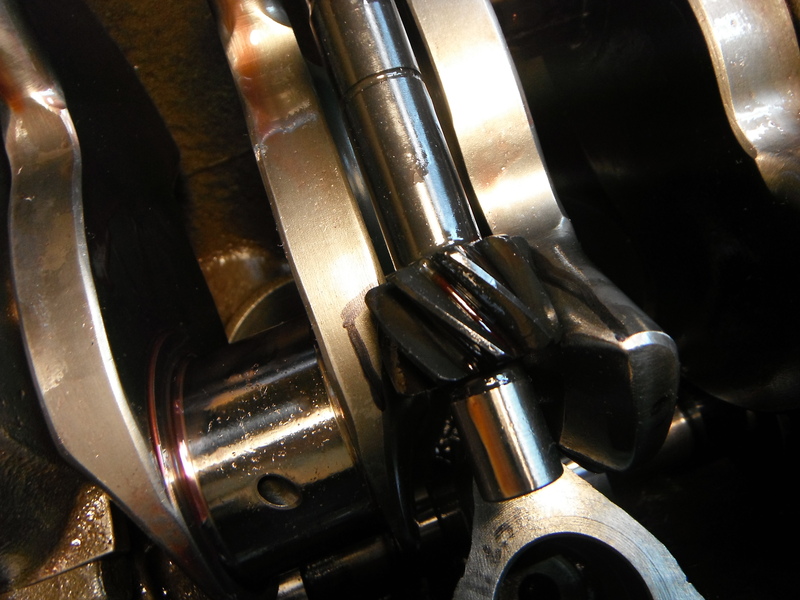 One option is to simply get a more traditional MAG style crankshaft made. 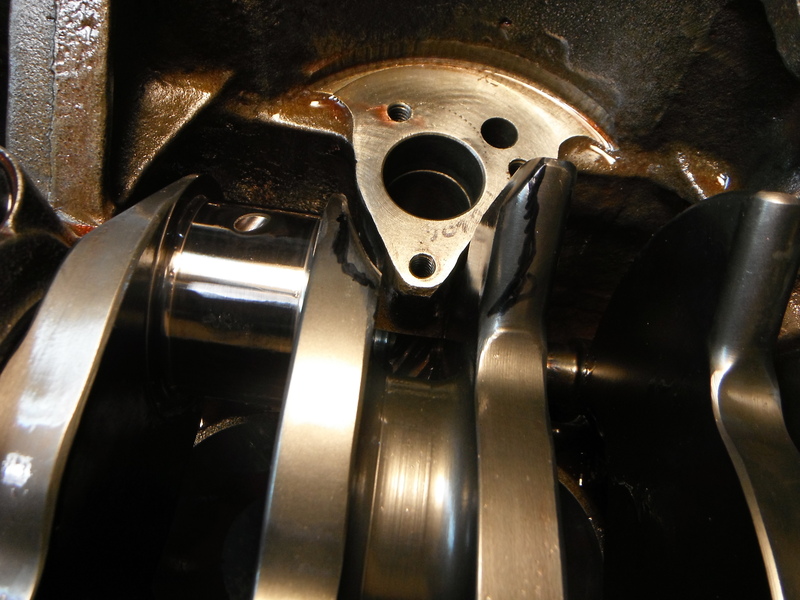 But to use this block, I need the MGB flywheel flange. So while I've gone quiet for a few days - mulling over my problem. I've disassembled that much of the engine as I had assembled. Need to start from scratch. 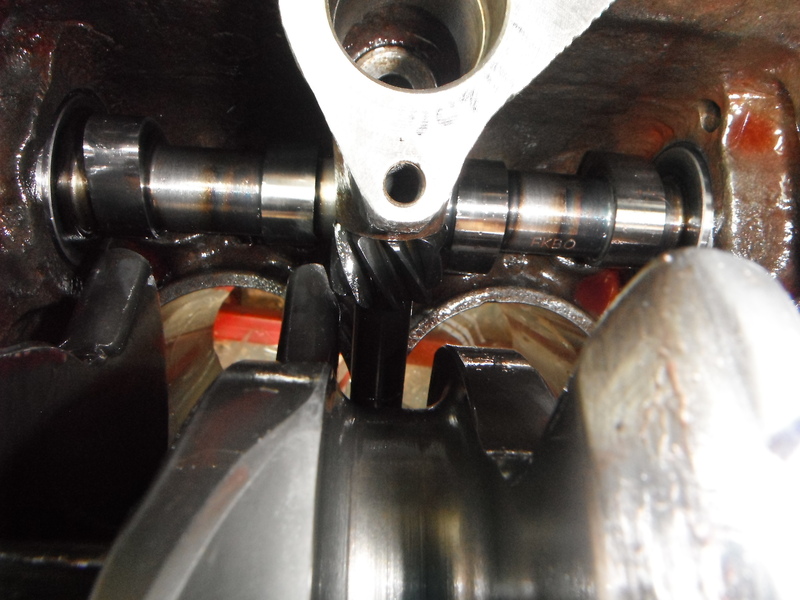 This photo shows the Distributor drive gear coming across the engine and sitting into the oil pump boss. No crankshaft. The drive gear is angled upward, left to right. This next photo shows the drive gear just laying on top of the crankshaft so one can get an idea of how much metal may require removal. 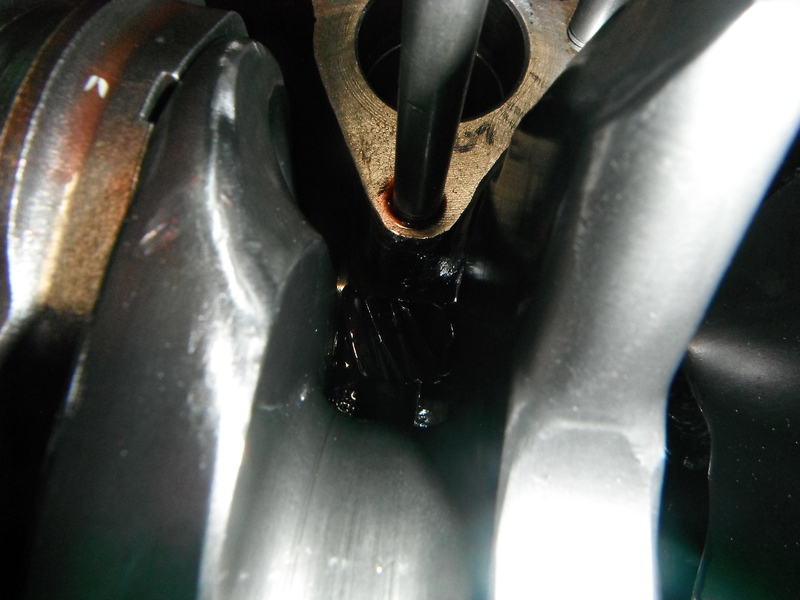 The tip of the distributor gear sits into the oil pump boss while the gear rides outside of it on the camshaft. My special concern is the backside of the counterweights where the rod journals are located. 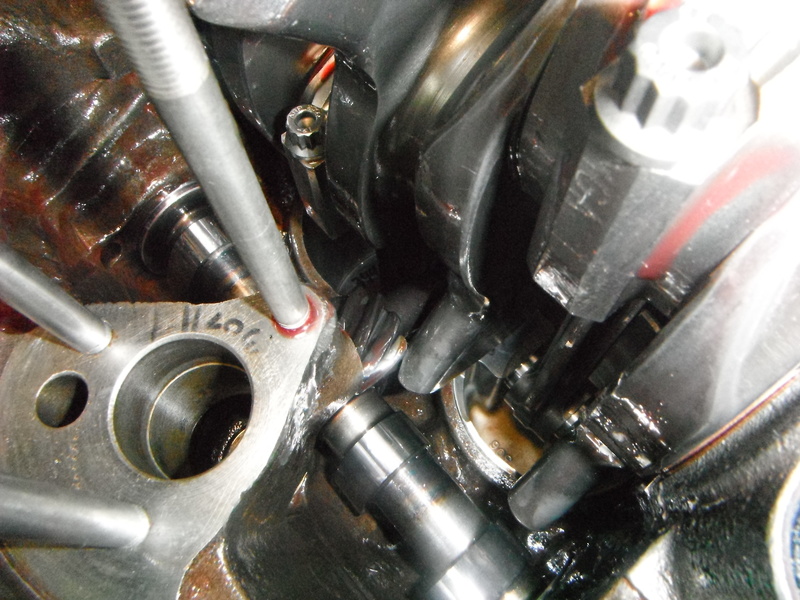 The counter weight to the right has already been shaved back to clear the oil pump. My rough guestimate of the amount of metal to be removed - this will be necessary on both front and rear sides of #6 and #7 counterweights. These photos attempt to demonstrate the conflict with the distributor drive gear in situ. The whole conflict was hard to photograph. But I hope these provide an idea of my problem. 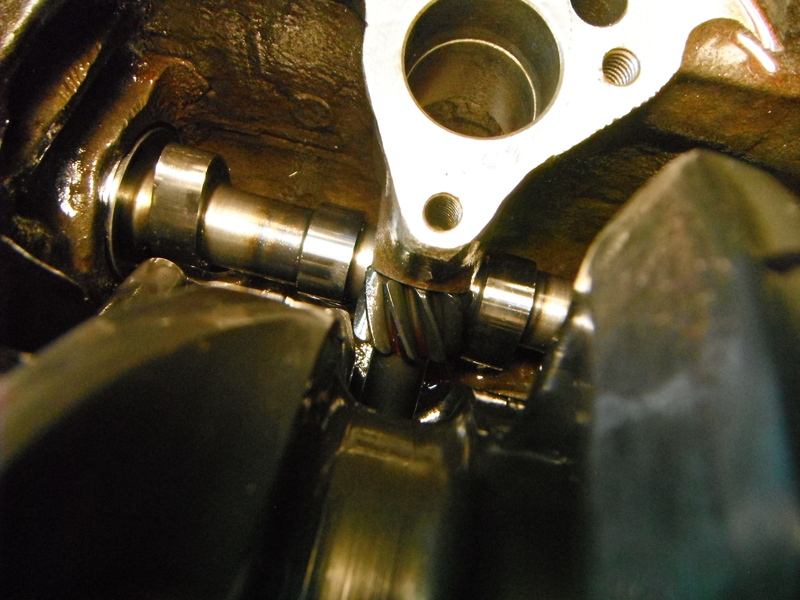 Dave Eden at Marine Crankshaft invited me to return the crank for regrinding and rebalancing. But I think my ability to accurately mark the crank for "cutting" is non-existent. I think I'll first try to take everything back to Carlquist Engines to see if they can address my problem. 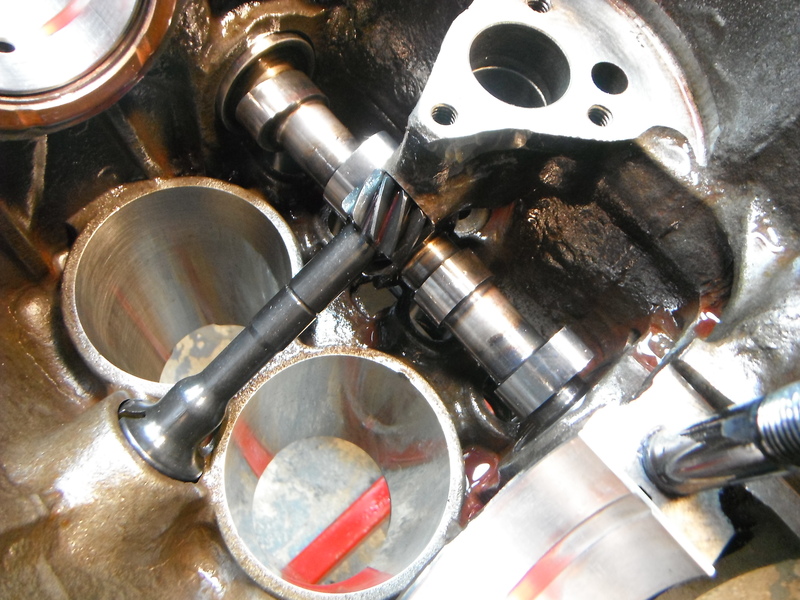 I think it best if they can fit the parts rather than me just sending off the crank for modification. I took the engine block, crankshaft, camshaft, distributor drive and front plate attachments to the machine shop on Wednesday morning. They didn't throw me out. Mike, the machinist I spoke to, glanced at it but didn't seem too impressed with my concern about the resulting diminished strength of the crankshaft. Time will tell. In the meanwhile, I am starting the season with Eric's rebuild of my spare engine. Last year, I ran it with a thermostat blanking sleeve and felt that it ran a little hot - race temps getting up to maybe 220 degrees at times. In the old engine, Hap used his fender washer trick - a 2" diameter fender washer with a 1/2" hole - and that engine ran very cool. Indeed it was hard to get it up to temperature. I'm thinking of trying that, but with perhaps a 3/8" inch center hole. Another option, I suppose, is to run an extra coolant hose from the heater valve outlet at the rear of the engine and splice it with a fitting to the top radiator hose. Not sure whether there is merit to this approach. New to NY (Finger Lake region): emissions?